Guadalupe Garcia McCall was born in Mexico and moved to Texas as a young girl, keeping close ties with family on both sides of the border. Her poems for adults have appeared in more than a dozen literary journals. She is a middle school teacher and the author of two novels for young adults. She lives with her family in Texas. By day Guadalupe Garcia McCall is a middle school English teacher who delights in teaching her students to dig inside of themselves for new ideas in their writing. But at night, when she shuts down her computer and leaves hall duties and grade books behind, Garcia-McCall becomes one of Latino literature’s shining stars. 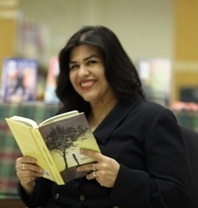 She is the 2012 winner of the esteemed Pura Belpré Prize and the 2013 Tomás Rivera Award for Under the Mesquite, a novel in verse that captured readers with her stark and honest celebration of Latino life, family, and hardship. In this Q & A, she tells us about the connection between personal loss and art, about how free verse was the key that unlocked a trapped story, and finally, about the three most important things she’s learned about being a strong girl. Meg: You’ve been recognized as an emerging poet, as well as an award-winning novelist. Do you feel more comfortable in one form over the other? What are the factors that go into deciding whether you’ll write in a novel in verse or a more traditional format (as in Summer of the Mariposas)? Guadalupe Garcia McCall: I like to think of myself as a storyteller. I think that is why I am most comfortable writing narrative poetry. I love the free verse style because I don’t have to conform to too many rules. I can explore imagery and metaphor at my leisure… find them where they live, look for them where they hide, pull them out of their little holes, and say, “There…see? This is what it is. This is what I found…this is what scares me, what bothers me, what motivates me, what moves me.” I need the freedom to dig, to find, to reveal, and free verse lets me do that without worrying about rhyme scheme or format or structure. Because to be honest, I am just too busy digging around to worry about those things. On the other hand, I love the luxury of prose. It is so…INDULGENT. It’s like laying in a boat with your eyes closed, letting the sun drain you, lifting one eyelid and then, quietly, slowly, delving into a good story…whispering it…making the reader wait while you lay it out for them…giving them one small sip of it at a time, like iced tea on that hot summer boat ride, until their thirst gets the best of them and they clamor for resolution. That’s what I loved about reading prose and that’s what I love about writing it. The thirst, the hunger, the need for more. Always more. How do I decide how to tell a story? Easy. I let it unfold as it may. I sit down and start writing, and let the narrator inform me. I knew Mariposas was going to be prose. The story was too long to be told in verse. I tried giving it structure, but it just wouldn’t be reined in. The narrator wanted to wonder, reflect, explain, and I understood. My narrator needed the time and space to tell her story, so I relented. And I’m glad I did, because by allowing it to flow in that way the story became a pleasure to write. It came quickly and effortlessly, and that’s always a blessing. MM: Under the Mesquite was your debut novel – based on your own difficult teen years. Were these life events always something you thought you might want to capture in fiction? What finally brought you to the project at last? GGM: Writing is therapeutic, and I think I was writing about that difficult journey for years without realizing I was doing it. I actually attempted to write it in prose a long time ago…but it didn’t translate well, and, consequently, it didn’t get published. It wasn’t until I gathered all my poetry, all my memories, into one manuscript that it came to light. My story was there, waiting to be put together, I just didn’t know it for a long time. It takes a great editor to figure it out…and Emily Hazel at Lee & Low did that. She brought it out of my poetry. She’s the reason the poems went in that direction. She saw it before I did. I’m glad it’s out there now. It’s an important story, one many young people can relate to. It honors my mother, her love for us, so I’m happy that it finally made it into print. MM: Girls of Summer is a summer reading list that celebrates strong girls. Looking back at yourself during those difficult times, what was it about you in real life that made you a strong girl? Was that Lupita’s secret, too? GGM: I didn’t feel strong at the time, but, looking back, I see that I was. Like Luptia, I think the most important factors in my life, the places I always go for strength, are my faith and my love for family. My mother created a loving, nurturing environment. She made sure we knew we were loved, and my father brought us to faith. I can still remember those beautiful Sunday mornings when we would cross the border to attend church in the Sanctuario de la Virgen de Guadalupe in Piedras Negras, Coahuila, Mejico. How we knelt together, resando (praying), cantando (singing), saludando (shaking hands), and blessing strangers. Then, after all that love and warmth, stepping into the sunlit plaza to buy sweaty, buttery ears of corn to eat while Papá looked at us with pride and joy. That is familia, and that’s where I go when things get tough. I reach for those I love and I give thanks for them. It puts things in perspective. MM: You are trained in theatre arts as well as English, and Lupita, of course, is a drama student in the novel. What is it about the dramatic arts that can help a kid who is struggling? GGM: Drama is all about emoting, so it is a safe way of exploring the darker, more physical, more destructive emotions that plague us as humans. I know how it feels to want to scream, to shout, to strike, to hurt, but society would not approve of such behavior and, let’s face it, it would be pretty detrimental if it did. Exploring those feelings through dramatic interpretation, allowing the body to respond, to act out, to express those feelings is cleansing. I can remember dropping to my knees and weeping at the loss of baby Astyanyx in my dramatic interpretation of Hecuba in high school. I was relieved to be able to let that pain go, to release it, without the burden of letting people know what was really going on in my life. Sometimes teens hold onto pain and suffering for fear of being judged or ridiculed, and dramatic interpretation allows them to turn it into art, to share it with others in an acceptable, productive, meaningful way. MM: There were many poignant moments in this novel, but one of my favorites was Lupita’s insistence on her own future, despite her father’s wishes. Of all the many, many “adult” things she is forced to take on in the novel, that simple act of disobeying him is so powerful. Can you talk about being strong enough to stand up to people we love? GGM: Being strong, or strong-willed, as I have always been is difficult, especially when we are teenagers because it can get us in a lot of trouble. And it’s even worse in adulthood, because people don’t like being challenged. Most people want you to play nice and not question them. In life, I have learned three things. (1) Being compliant makes life easier, (2) but being strong is vital, (3) so knowing how to stand up for yourself is the most important thing of all. Fighting for what you believe in, if it is for a good cause, is always worth doing. However, there must be dignity and integrity in that fight. Courage must be balanced by wisdom and strength must be laced with kindness and mercy for others. You don’t have to be mean. You just have to be strong. MM: Under the Mesquite is such a beautiful addition to the body of work by Latino authors that is available. There has been much recent conversation about the relative lack of Latino literature being published for children and teens – or at least its lack of visibility. [School Library Journal. The New York Times. ]From your chair, what are you thoughts on that? Why does promoting quality in Latino literature in schools and libraries merit serious debate in 2013? GGM: We, as Latinos, have so much to offer the world. Our culture is full of life; how we love, worship, think, and act is rich with tradition. But how we feel, love, and hurt is the same way the rest of world feels, loves and hurts. And it is because of those similarities that we are connected to the world around us. But, as things stand, those connections are broken, shut down, dead, because our voices are not being heard. I keep hearing from Latino writers that they are not getting published. And I keep hearing from publishers that we as Latinos are not submitting enough of our work. I don’t really know what the problem is; all I know is that we are mute right now. The wires are twisted or bent or frayed. I don’t know which, but we need to fix them. More Latino writers need to write and submit their work, and more publishers need to actively look for and publish our words. It’s time we all worked together. Our Latino population is growing and we need to feed the young minds of our Hispanic community. We need to find a way of reaching them, pulling them in, making them part of our world, and reading is the best way to do that. Inclusive information, entertainment, and public acknowledgement is what is needed here. As Americans, we can do this. We can work together. We can celebrate our differences. We can let our similarities inform and unite us. And, eventually, with faith and courage and wisdom, we can rejoice in getting it done. MM: As the winner of the esteemed Pura Belpré prize for children’s fiction, you stand in company with some of the giants of Latino literature. Where were you when you got the big news?What’s been the effect of winning this prestigious award on your writing and career so far? GGM: It was a Sunday and I was actually in a hotel room in Dallas, rehearing my Morris Finalist acceptance speech, when I got the call about the Pura Belpre. At first, I didn’t understand what the committee chairman was saying. I had been waiting for a different phone call, a phone call from another committee, letting me know where to deliver the batch of books for the Morris Award Ceremony. So when the Belpre committee called, it threw me off, and I kept thinking… No. They have it all wrong. I didn’t win the Morris. I’m a finalist. It took a while for the committee chairman to convince me that I had indeed won an award, and that award was the Pura Belpre. There was a lot of giggling in the background, at the blubbering and confusion and shock and gratefulness and tears at my end…it was…a wonderful moment. What a blessing that award has been! A ray of hope has touched me. Hope that our voice is being heard, that our culture is being acknowledged, that our gifts are multiplying and reaching across America. That we are becoming part of this country, this great world, this wonderful universe. MM: One of my favorite things about you as an author is that you are still a working teacher as well. (I was a teacher for ten years and loved it.) Tell us about your “day job.” What is it like to teach full time and have a writing career of this caliber? I’m wondering, for instance, when you sleep? Also, what are your quirks as a teacher, your pet peeves? Are your students ever star-struck? GGM: I love my day job. I love it when kids “get it.” I love watching them sit at their desks whittling at their work, scratching away at that paper, stopping to think with that faraway look in their eyes, and then quickly scribbling it down before it gets away from them because I taught them to think, to dig in their minds, and write it all down. There is nothing more exciting than seeing them involved with their thoughts and then being allowed to read the product of their reflections. It’s a beautiful thing. Teaching full-time and trying to write full-time is a pretty big undertaking. But, I’ve never slept much. A great line, a wonderful piece of dialogue, a super-exciting twist in the story injects me with energy and I simply can’t sleep until I get it down on paper. Hmm…my pet peeves…I suppose they are the same as any other teacher’s pet peeves. I don’t like duty. I hate short lunches. And grading is such a chore! But I love active learners, involved learners, willing learners. Are my students ever star-struck? Nah, they’re just the way I was when I was their age…too self involved to think about my teachers as humans. I just know they think I live out of my classroom closet. That when they leave, I sit at my desk, shut down like a computer, and wait there perfectly still until the next morning, when something in my brain activates and I get up, step into my closet, change outfits, and open the door for them. I’m not joking here…seriously. You should see how shocked they are when they see me shopping at the grocery store. “What are you doing here?! ?” one of my students asked me one day, jumping away from me when he turned the corner of the store, into the freezer section, and saw me standing there with my cart full of groceries. “I don’t know,” I said, winking at his mother standing behind him. “I think I’m lost. I should be sharpening pencils and straightening desks before I go to sleep behind my desk…right?” He laughed then, because he saw how silly it all was. MM: Summer of the Mariposas is on the shelves and has all the signs of a great follow-up. What are you working on now? GGM: I am working on a historical novel-in-verse set in 1915 Texas. It speaks about the struggles, racial tensions, and violence between the Mexican Americans and the Texas Rangers brought on by the Plan de San Diego (a manifesto that caused a short lived but devastating period of unrest in the Nueces Strip, what is now known as the Rio Grande Valley). I don’t want to say too much about it because I don’t want to jinx it, but I will say this. It has been both shocking and eye-opening to research it. It has been rewarding to write it, an honor to shed light on it, and I hope to someday soon find a home for it.